All our titles are registered. "Stand out from the crowd in 2019"
at next Manorial Ball May 2019. Why buy a genuine Title from us? In life we show the world that we are successful by where we live, the car we drive, the clothes we wear, the cell phone we use. A real Title tells the world that you are upper class not a commoner. It’s on your bank cards. People will see it daily. Creates respect, admiration and puts your ‘self-esteem’ into the clouds, making you feel special every day. No matter what your age, it’s never too late. You deserve it for yourself and your family. No one considers you bought the title. They think you inherited it from your family. They believe you come from high society. They feel you are like royalty an aristocrat, therefore allow them to think, believe and feel you are from a successful family of breeding. ‘Noble Class’ or ‘Nobility’. Be a ‘Somebody’ stand out from the crowd. You only buy once, so buy the best! when you buy just 1 ticket. for any nationality to buy. CONFORMS WITH: "Honours (Prevention of Abuses) Act, 1925"
All our titles qualify the buyer to join "Title Nobilis"
All our titles are registered at the "Landed Gentry Register"
Every Title is vetted and researched to ensure it is genuine before we offer it for sale. 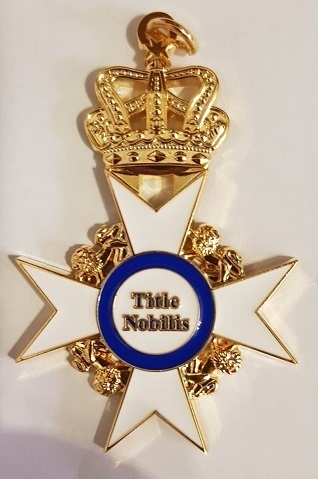 Nobility.co.uk are "Heritage Researchers and Purveyors of Titles, with over 22 years of experience in genealogical research, we buy and sell genuine titles (proof of ownership is required). Our researchers are members of the Society of Genealogists. Titles 'Hundreds of Years Old' Recorded in English History Books, including Titles once held by Kings & Queens of England & Titles held by Knights Templars & Hospitallers. The Manorial Feudal Title system started in England in 1066 with the invasion from France by William the Conqueror in the “Battle of Hastings”. In 1086 an audit was made called the ‘Doomsday Book’ cataloguing who owned what and where, this was for tax reasons. The Feudal system was originally a form of governing and tax collecting, where the “Vills” (villagers) paid tax to their Lord of the Manor, who kept some and paid some to the Baron (principal Lordship) who kept some and paid some to the King. Feudal means ‘Based on land ownership’. With the industrial revolution villagers came off the land to get higher paid jobs, this resulted in the breakdown of the Feudal system forcing Lords and Barons to pay for work carried out by their subsistence farmers, whereas before they had to do work for the Lords or Barons for free and pay them tax. With the advent of the motor car and the necessity for more roads, the UK government reformed the rights that Lords and Barons had over the land and introduced the Law of Property Act 1925, which introduced the Land Registry. In the same year there was a precedent Court case Beaumont v Jeffreys where land was sold and the seller kept the Lordship Title, a judge ruled this was legal, after which the Law of Property Act was amended ruling all Manorial Feudal Titles separate from the land itself, therefore all Titles since 1925 have been separate from the land itself. You can buy the Title without owning the land. There are companies selling “Landed Titles”, these are (under the laws of England and Wales) “FAKE”, they are souvenir land plots (WE DO NOT SELL THEM). We were one of the first companies to use the Internet as a source of information for potential customers and after many years of trading have built up an enviable reputation. Many of our customers stay in touch with us and some have even become friends. We will be very happy to assist you with our experienced and confidential service'. Titles make excellent unusual presents: Birthday, Christmas and Anniversary Presents "For the person that has everything". How to become a Lord of the manor is simple, just choose your title from our list available, click and purchase within minutes. Even if you do not have a bank card you can purchase through fast bank transfer. Secure Online Credit / Debit Card Transactions. Noble Titles Office: Kemp house, 152-160 City Road, London EC1V 2NX.